shane charlton is a very confident young man. 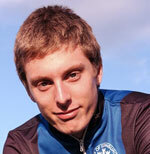 in his letter of introduction, he describes himself as a world class cyclist of the future, and who are we to disagree. it would be easy to mistake his confidence as arrogance, but at seventeen, he not only knows where he's going and how he's going to get there, he has a remarkably old head on his young shoulders (yes, i hate that cliche too but it just sort of popped out). why cycling? aren't all seventeen year old boys into football? The prospect of regular injury and rolling around on the floor doesn't appeal. I also was drawn by the fact that I was doing something not many other people my age are doing, as such have greater chance of succeeding. I draw inspiration from a number of cyclists for different reasons, mainly because of how they have handled understandably difficult circumstances. Chris Hoy and Craig Mclean come up as being impressive in my mind, and for any of you endurance roadies who haven't delved into sprint training, just to let you know, it is a lot tougher than endurance training. Whereas with endurance you can ease into a ride and prepare mentally for a hill approaching, for example, with sprint it is 100% all the time and you have to be 100% focussed as well. how much training does a seventeen year old have to do? People mostly ask this question with an expectation of mileage as the answer, and I usually have to explain to them that mileage is not important, it is time. I train in phases, working for 4-6 weeks on a particular aspect, and during which there are different volume loads per week, with the highest volume week last month being 23 hours. By June I will be training 30 hours per week. do you still have time to be a teenager? The simple answer to this is NO. However, I am not a robot, I do enjoy time out to read the newspapers at the local library, I watch the O.C. drama on TV, I go out with my girlfriend to the cinema, for examples. In many respects I am just like any other teenager- looking to find the support I need to move onto the next stage in my life, hopefully making a career out of cycling, however, I like to think I am a lot more dedicated and more disciplined than most my age. To cover the costs, I am also looking into business. what do your friends think of the charlton cycling master plan? To be quite honest, my close family and friends are very supportive, and they believe I have the work ethic to create a great satisfaction amongst people who go the distance with me. Since I started cycling as a leisure cyclist at the age of 10, each year a snowball effect of opportunity has arisen, and already I have represented GB and Scotland in International competition, and won. there used to be a rule (maybe still is) that juniors only used a restricted gear range when road racing. do you adhere to this in training? Are you mechanically adept - in other words, can you fix your own bike if it breaks? For the first two years of cycling I left the mechanical side of things to my dad since he works in car maintenance, repair and diagnostics, but for the past six years I have stripped and rebuilt my bikes several times, serviced them, replaced bits when required, if I have a puncture I am strong enough to get the tyre off the rim etc! are your parents supportive of your cycling ambitions? I believe my parents are a little apprehensive about cycling because of the lack of structured planning - however, they also know it is what I am best at, and so support me as best they can. It's an expensive sport, and the fact that there is a lot of travelling involved, means I have to look for ways to fund myself, begin fend for myself. I used to play the guitar, violin, recorder at primary school! The fiddle is something I was particularly attracted to, and I gained a lot of satisfaction out of learning new pieces. Consequently, cycling took over as my ambitions lie there, and I don't have enough time to practice both to an elite level. 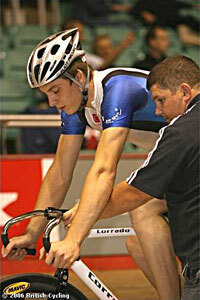 what prompted you to specialise (initially) in track cycling? I mentioned earlier the snow ball effect of opportunities and support that has occurred throughout my teenage years, and hopefully will continue. I didn't choose track, but because I raced the grass track events at Highland Games from the age of 11 I was already quite an expert at riding fixed by the time I started riding at Medowbank Velodrome in Edinburgh. From there I was invited to the under 14 British Championships, and ended up winning the omnium overall, and taking a British record from Geraint Thomas by over five seconds in the 1500m pursuit. do you buy all the cycling mags? I don't have money lying around for those sorts of luxuries you know! However, I do receive them from a local cycling enthusiast who started me racing at the Grass; I also believe that most of my initial understanding of training and pathway through cycling came from such magazines. High 5 for long rides, 4 to 1, my personal favourite. Gatorade, I am told, is extremely effective for that boost you need on a drive home from racing! I tend to stay away from the much used Red Bull nowadays. After the 2005 British Track Championships I drank five cans before the Kilometre T.T. and didn't notice any difference. I have to admit it all looks great on the can - very good marketing. do you buy bike clothing/bits for form or function? When In the saddle for the amount of time a full time cyclist is, it has to be for function, and most of the time if it performs as it should. If it's of good quality, then it usually looks good as well. money no object - what bike do you buy? Either an Argon or a Time.The Time looks great, although it's very pricey, The Argon is meant to be one of the stiffest frames around, and for a beefy 87kg endurance sprinter most frames I come across aren't up to scratch. 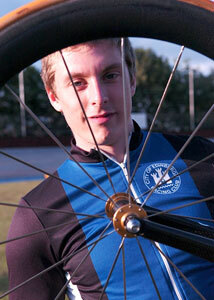 graeme obree said that the key to success is not to have a backup plan? do you have one? I don't even have A plan. I have an ambition, but to achieve that, I rely on people providing me with opportunities. I agree with Graeme, in fact, because if you have no other option you will have to find a way to make do with what you have. what would a potential sponsor gain from sponsoring you? How about being associated with a growing brand? I believe that being associated with an up and coming, young, potentially World Class sportsperson not only shows the customer base and local community their great spirit and kindness towards people in a difficult position which perhaps they have once been in on their journeys toward success, but my close links with local and national broadsheet and tabloid newspapers, as well as radio and television would also benefit this theoretical association. Of course, my growing web presence may benefit their online side of the business by sharing customers by linking up with each other, in addition. Shimano for price, Campagnolo brakes for braking power, Campagnolo shifting/ changing, I use Shimano because it is what comes with most bikes, and as such is a lot cheaper than buying the individual group set and fitting it to a frame. would you like a future on the track or road? Hills don't seem to be my thing at the moment, and are the main inhibitor against my true racing potential on the road. That's probabaly just as well, since two years ago I decided to use my massive natural raw power and size to my advantage on the track, representing GB. Plus the fact that all road racing teams on the continent seem to have drug scandals as a permanent fixture to their auras. what constitutes shane charlton's typical training day? You can keep up to speed with my training schedule on my website, www.shanecharlton.co.uk, in the 'track records' section, under the 'training diary' menu. As I stated previously I train I 4-6 week blocks to work on improving one or two certain elements of performance. Currently I am working on climbing specific strength on the bike, as well as endurance, by riding 3.5-4.5 hours per training ride with prescribed hill reps in the middle. I also attend strength and conditioning sessions in the gym twice per week to work on recruiting as much of the muscles' power as possible, without bulking out like a body builder. will you still say hello to us when you're famous? I certainly will not forget all the people who make it possible. Already I can think of a good dozen or so names. My sponsors, St Andrews based website and internet systems designers Helios have been especially supportive. Not only are they providing my website, along with hosting, maintenance and IT support, absolutely free of charge on an ongoing basis, but Director Roger Wharmby and his wife, Ann, take a personal and friendly interest in what I'm doing and have given generously of their time to give technical and business advice which is already proving invaluable. To be truly open, I understand that no one can reach the top of their game single handed, and that everyone who is successful in anything they set out to achieve has an inner circle of people who they trust, and who work towards their ambitions, to make them achieve the best they can. I need as many people as possible on my side.